A group of protesters on Tuesday tried to gatecrash into the University of Hyderabad to take part in a meet organised in memory of Rohit Vemula on his first death anniversary but were whisked away by police. The protesters comprising a number of students' organisations had assembled in front of university's main gate as part of "Shahadat Din" of Vemula, who was found hanging in a hostel room on the varsity campus on January 17 last year. A section of students under the aegis of Joint Action Committee for Social Justice -- the UoH said they would gather at the 'Rohit Stupa' to remember his legacy and to vow that fight will go on against "casteism and communalism". The protesters marched towards the main entrance gate of the university, raised slogans against vice-chancellor Apparao Podile and sought immediate his arrest. Holding placards reading "Justice for Rohit Vemula", the protesters marched towards the main gate and tried to forcibly enter by removing the barricade placed in front of the main gate. The police immediately took them away in a vehicle even as JAC members assembled near the main gate after coming from inside the campus. Vemula's suicide had sparked massive protests nationwide, resulting in a fierce political slugfest, with a string of political parties and Dalit organisations siding with students and accusing the Bharatiya Janata Party and varsity administration of being anti-Dalit. Also, it had triggered a huge political furore with the then Human Resource Development Minister Smriti Irani coming under attack along with Labour Minister Bandaru Dattatreya for having written a letter related to the matter. 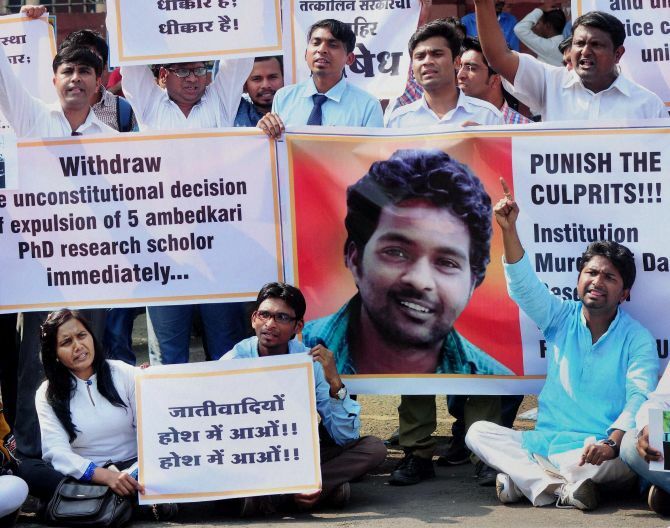 Raising questions on Rohit Vemula's Dalit status, a commission constituted by the HRD ministry after the scholar's death had said the material on record did not establish it and attributed his suicide to personal reasons. However, National Commission for Scheduled Castes Chairman P L Punia had rejected the judicial commission's report on Vemula's suicide as fake and fictitious, and said the deceased research scholar was a Dalit.